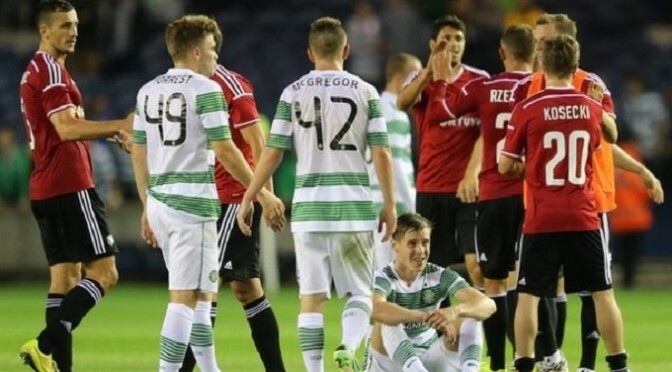 Celtic have been reinstated to the Champions League after Legia Warsaw were punished for fielding an ineligible player. Legia won the third qualifying round tie 6-1 on aggregate but brought on Bartosz Bereszynski in the second leg, while he was supposed to be suspended. As a result Celtic were handed a 3-0 ‘walkover’ win for the second leg, taking them through on away goals. Celtic will play Maribor of Slovenia in the play-offs later this month. And Legia Warsaw have been drawn to play Aktobe of Kazakhstan in the Europa League play-off. “It is very strange, I have to say that,” said Celtic manager Ronny Deila, whose Norwegian countryman Henning Berg is in charge of Legia. “First of all I feel very sorry for Legia, and my friends from Norway there. It is tough to think of that and now we are in the Champions League. “Legia played well against us, they put in good performances but this is nothing to do with Celtic. It is about UEFA. “It is not my business. It is a club thing and a UEFA thing. “It is a tough decision and I really feel sorry for Legia but we have to go into the game and prepare for Maribor. Legia have five days to appeal and have asked for Uefa’s reasoning. The Polish champions, who now take Celtic’s place in the Europa League play-offs, won the first leg 4-1 and the second 2-0.